Messier 86 (M86) is an elliptical or lenticular galaxy located in the Virgo Cluster, in the southern constellation Virgo. The galaxy lies at a distance of 52 million light years from Earth and has an apparent magnitude of 9.8. Its designation in the New General Catalogue is NGC 4406. Messier 86 occupies an area of 8.9 by 5.8 arc minutes of apparent sky, which corresponds to a linear diameter of 135,000 light years. The galaxy can be seen in 10×50 binoculars under good conditions, but only appears as a faint patch of light. Small and medium-sized telescopes show an oval-shaped patch with a brighter centre, while larger instruments provide a better view of the galaxy’s halo. 8-inch telescopes will reveal several fainter galaxies in the same field of view on a clear night. The galaxy lies close to the border with Coma Berenices and can be found almost exactly halfway along the line from the bright star Denebola in Leo to Vindemiatrix in Virgo. It appears in the same field with the nearby Messier 84, positioned 17 arc minutes west. 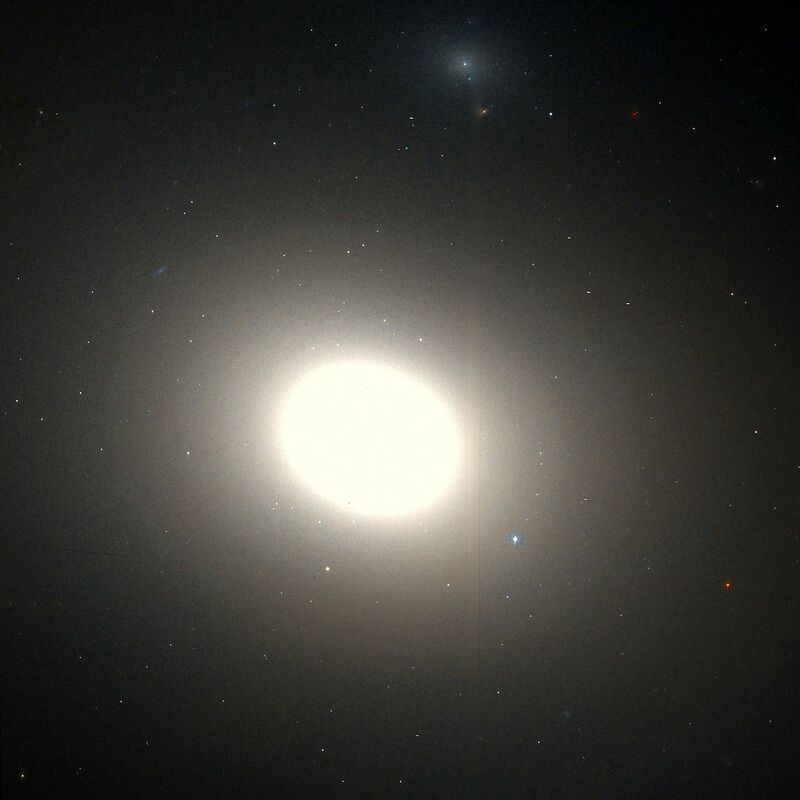 The giant elliptical galaxy Virgo A (M87) is only 1 degree southeast of the pair. The best time of year to observe the galaxies is during the spring. Messier 86 is classified either as an elliptical galaxy of type E3 or a lenticular galaxy of type S0. Newer classifications lean more toward the lenticular classification. The galaxy is home to at least 400 billion stars. Messier 86 is located in the centre of the Virgo Cluster and is one of its brightest members. It forms a striking group with M84. The angular distance between the centres of the two galaxies is about 16.5 arc minutes, which corresponds to a spatial extension of about 300,000 light years. Several other galaxies, including the edge-on spiral NGC 4402 (mag. +11.5) and the interacting pair NGC 4435 and NGC 4438, also known as the Eyes Galaxies or Arp 120, can be seen in the vicinity of the M84/M86 pair. The galaxies appear in the same field of view in binoculars and small telescopes. M86 is linked with the neighbouring disrupted spiral galaxy NGC 4438 by filaments of ionized gas. 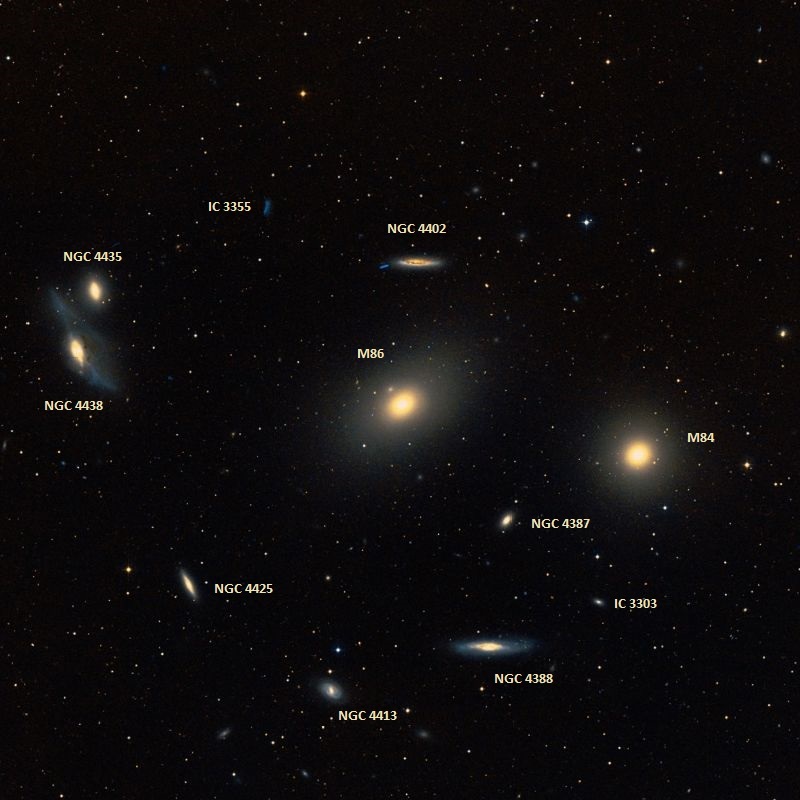 Messier 86 is a member of Markarian’s Chain, a chain of galaxies that also includes Messier 84, NGC 4477, NGC 4473, NGC 4461, NGC 4458, NGC 4438 and NGC 4435. 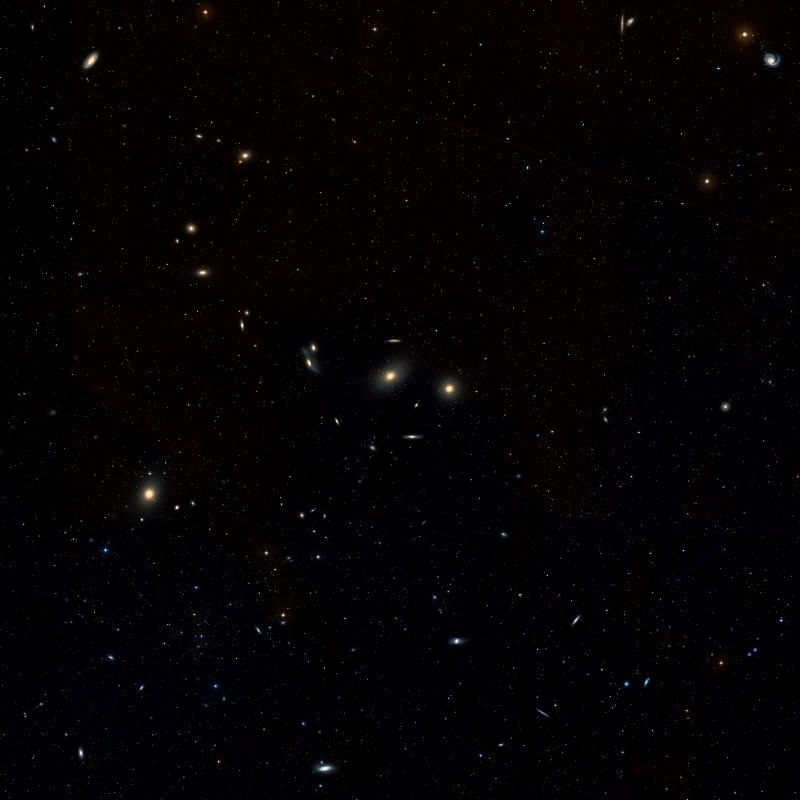 These galaxies appear arranged in a curved line when seen from Earth. Messier 86 is experiencing ram pressure stripping and losing gas as a result of moving through the Virgo Cluster at such a high velocity. The galaxy is leaving behind an enormous trail of hot gas, visible in images taken by the Chandra X-ray Observatory. Messier 86 is approaching the Milky Way at 244 km/s (419 km/s according to some sources), which is unusual for a member of the Virgo Cluster because the entire cluster is receding from us at an average velocity of 1,000 km/s. M86 displays the highest blueshift (fastest approaching velocity) of all Messier objects. 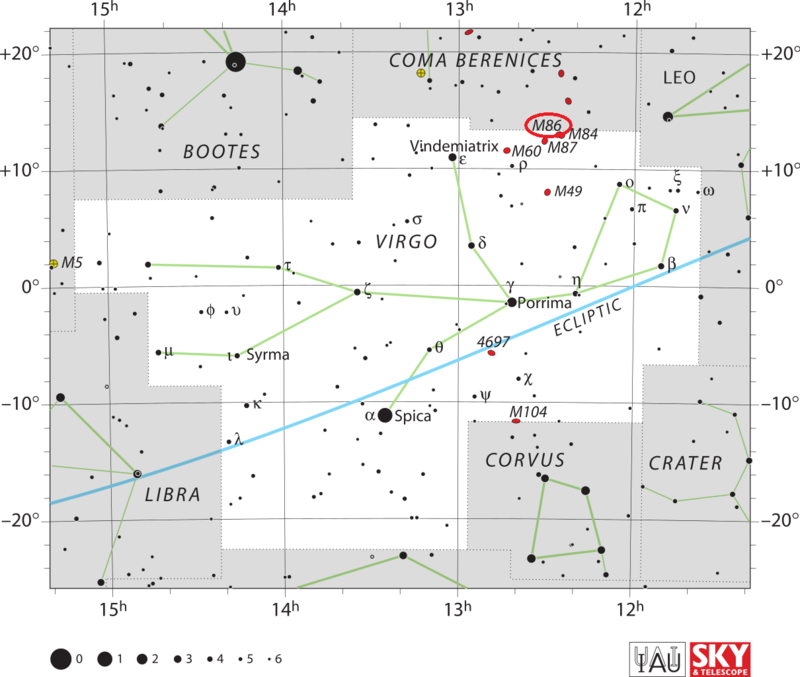 It seems to be moving toward us because it is really moving towards the centre of the Virgo Cluster from the opposite side, which explains the blueshift. Because of its enormous mass, the cluster’s core has a strong gravitational field, one that can accelerate any galaxy’s velocity to that observed in M86. For example, IC 3258, another member of the cluster, is approaching us at 517 km/s. Messier 86 has a population of about 3,800 globular clusters. 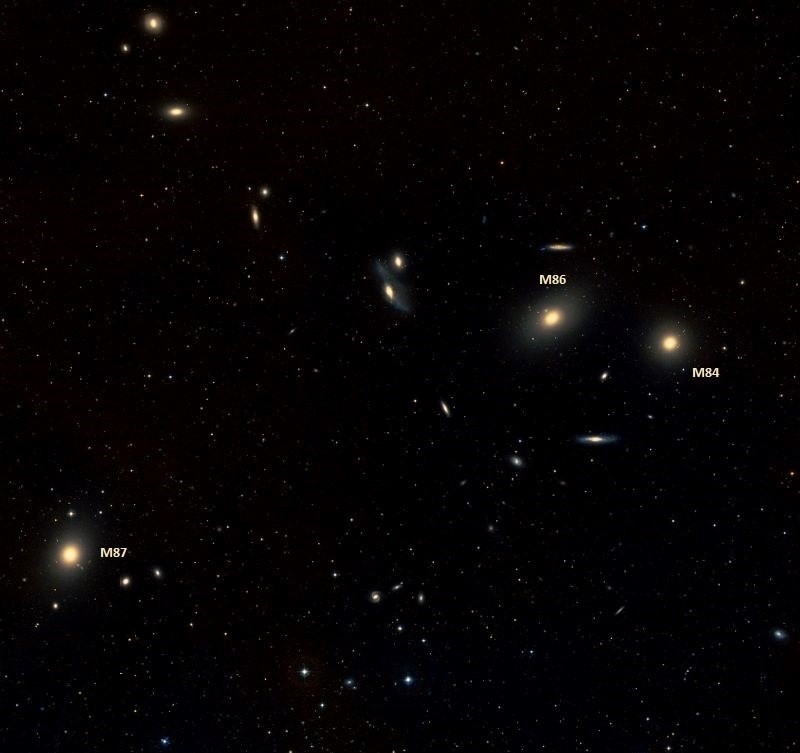 These, however, are not nearly as populated as the clusters observed in the nearby giant galaxy Messier 87, which lies to the southeast of M86. There are also a number of stellar streams in the halo of M86. These are believed to be remnants of dwarf galaxies that have been absorbed by their larger neighbour. Messier 86 was discovered by Charles Messier on March 18, 1781. 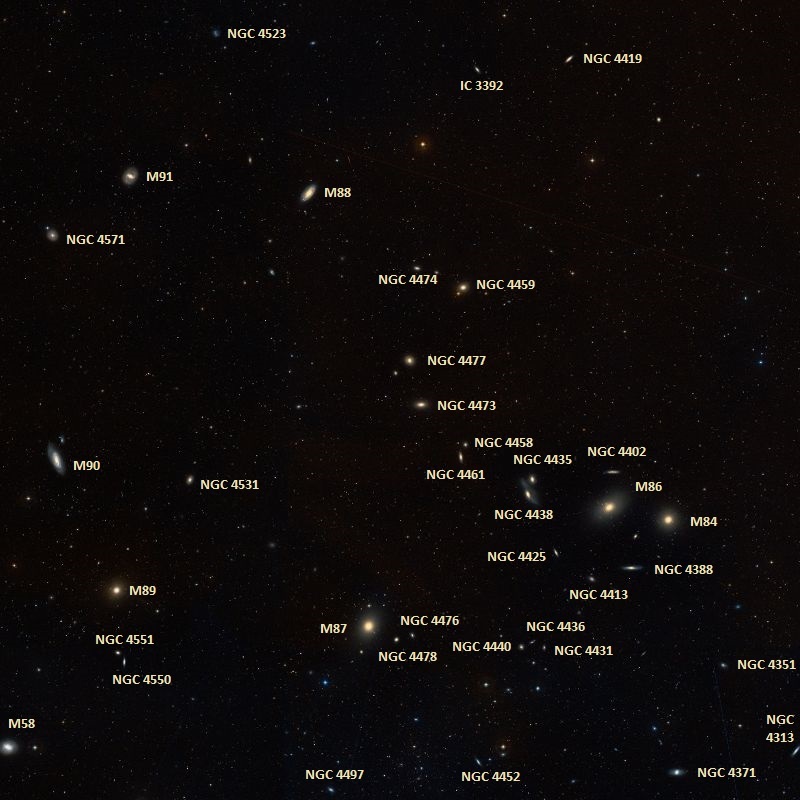 On the same night, Messier also discovered and catalogued seven other galaxies in the Virgo Cluster – Messier 84, Messier 85, Messier 87 (Virgo A), Messier 88, Messier 89, Messier 90, and Messier 91 – as well as the globular cluster Messier 92, located in the constellation Hercules.